The module has features to create, modify, delete, view and list the companies inside CMS. Multiple companies might use the same CMS and their data will be categorized by company name. Any users in the CMS must be under one single company. The first step to use CMS is to create one company. During company creation, one admin user of that company will be created automatically. Then, super admin will create the cms users one by one. Any user, role, user group and their association must be under one single company. One company should not able to see other’s company data. As master data, initially there will be one existing company (dummy) which is called “Super-Super-Admin” (SSA). SSA will be able to see business data from all the other companies. – create a company by SSA. – Super admin of the newly created company will be created automatically by stem while creating the company. 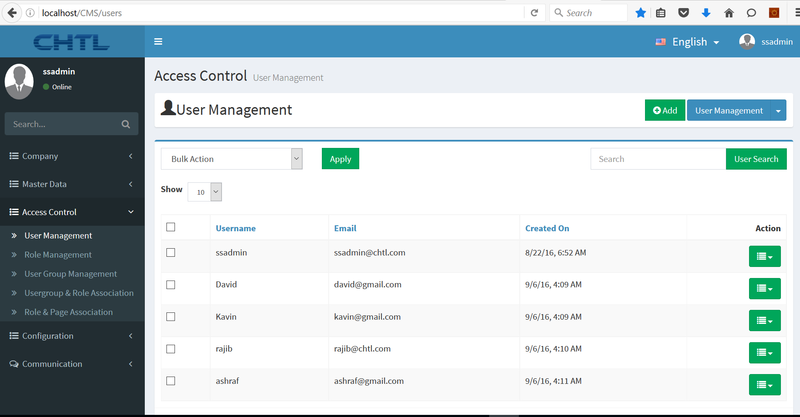 – Super admin will get an email and login to CMS. – Super admin will create users. Users will be notified to login. – Super admin will create user group. – Super admin will create Role. – Super Admin will associate Role and allowed Events (Page). – Super Admin will associate User group and Roles. – Normal user login to CMS after receiving email. – Normal user will be able to see the features provided by Super Admin by associating user group and corresponding roles. User needs to provide valid credential to login in CMS. The credentials will be sent to their email address during account creation by super admin of their company. There is another option to modify their profile data and logout from CMS system. User has ability to switch one language to another language. There is an option to retrieve account password in case user forget it. An email will be sent with details instruction of how to retrieve and reset their password. The preset data should be available for core modules. For business modules, it should be dynamically managed.